It's so simple; all you need is a mirror, some blue paint, and a love for Valve's masterpiece in virtual teleportation. Suitably, considering this comes from Sweden, the mirror is from IKEA (a Kolja, if you're taking notes), and the rest really is as simple as it looks. 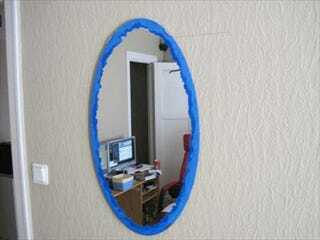 Just paint a two-tone blue border around the oval-shaped mirror, stick it on your wall, and you're good to go. Those requiring the full Portal effect, just buy two mirrors and get some orange paint!